NVISION Laser Eye Centers is giving away two tickets to the final game of the season – San Diego Chargers versus the Kansas City Chiefs – on December 28, 2013. NVISION is the official LASIK center of the San Diego Chargers. “I have performed LASIK surgery on several San Diego Charger players, including Malcolm Floyd, Kassim Osgood and Quentin Jammer,” says Dr. Max Parikh, a LASIK surgeon at NVISION Laser Eye Centers La Jolla, Calif. location. Quentin Jammer, Chargers Cornerback #23. As the San Diego Chargers Official Team Ophthalmologist, Dr. Parikh knows the importance of precision in LASIK San Diego procedures. And, having undergone LASIK surgery himself, he understands the process both as a surgeon and as a patient. 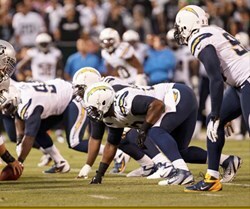 To register to win the San Diego Chargers’ tickets, go to http://www.nvisioncenters.com/chargers. NVISION Laser Eye Centers is an innovative leader in lifestyle surgical eye care with 15 locations throughout California. NVISION is the first provider in California to offer LASIK eye surgery with the Swiss-engineered Ziemer Femto LDV™ Crystal Line Laser. In addition, NVISION is the first provider in California to offer the bladeless, computer-controlled LenSx laser -- unquestionably the most technologically advanced option for laser cataract surgery, and the first in the nation to offer Avellino DNA testing for an added level of LASIK safety. With more than 1500 eye doctors who refer their patients and trust their own eyes to NVISION surgeons, NVISION Laser Eye Centers is the Eye Doctors’ #1 Choice®. For more information, visit http://www.NVISIONCenters.com or call 1-877-91NVISION (1-877-916-8474).